The jeepney is a form of public transportation found in the Philippines. The first jeepneys were rebuilt from surplus World War II US military jeeps that had been sold or given to Filipinos. After most of the country’s infrastructure and systems of public transportation were devastated by the war, those jeeps were stripped, altered, and decorated with vibrant colors so that they could accommodate more passengers. 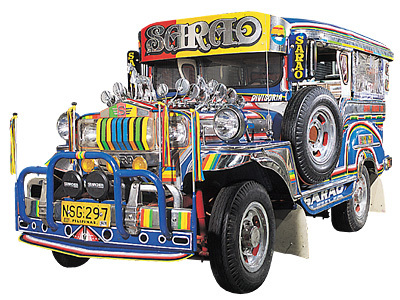 These flamboyantly-decorated vehicles can seat anywhere from twelve, to twenty-two passengers, not including the driver and riders who hang “sabit,” from the jeepney’s back entrance. They are a true testament to Filipino ingenuity and adaptability. Today, jeepneys are as much a boon as they are a bane to Filipinos on the road. For commuters, it is a cheap, abundant, and easy way to get from one place to another. For fellow motorists however, jeepneys are notorious for tailgating and stopping in the middle of the street to pick up fares. But, love them or hate them, it cannot be denied that jeepneys are an inevitable part of being on the road in the Philippines.